How many Sonic games can you count? Thirty? Fifty? I don't know the exact number and I can't be bothered to count them all, but there are a lot of Sonic titles out there - some better than others. 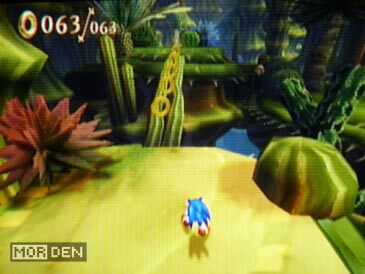 Yuji Naka's hedgehog has been around for about eighteen years now, and while back in the nineties the blue rodent was all the rage among gamers, the series has since then managed to tumble down the rabbit hole of mediocrity, Sega Saturn period being a noticeable turning point towards the seemingly inevitable demise of this franchise. The definite highlight of the whole Sonic series, for me anyways, was the MegaDrive era. Sega had a powerful piece of hardware at their disposal, and they knew exactly how to use it to make their blue lightning bolt run faster than ever. 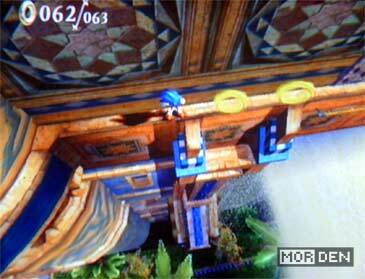 The remade Sonic [and Later Sonic CD], along with Sonic 2, 3 and Sonic & Knuckles are to this day a benchmark for a properly made, fast platformer. Sega had it right back then - they perfected the formula, and if they had decided to go with all 2D Sonic games until this very day, I'd still buy every single one of them. Unfortunately, you can't cling to the ways of 16-bits when the competition is hard at work, utilizing every bit of resource available, to make their 32-bit debut a guaranteed win. 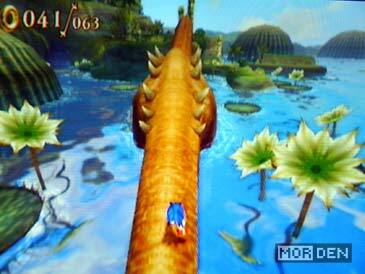 While Nintendo did not fail its fans, releasing Mario 64 on their 32-bit console, and while Sony, thanks to Naughty Dog, enjoyed alot of success with the newly created Crash Bandicoot franchise, Sega did not seem to be trying hard enough to recreate the flawless Sonic experience we all remembered from the MegaDrive days. If you have but once experienced how it is to measure every single platforming game by Sonic the Hedgehog and Mario standards, you probably know exactly what I am talking about. It seems that even though Nintendo lost some votes among Mario fans, platform adventures featuring the italian plumber still manage to surprise in an absolutely positive way, while Sega seems to be gasping for air while drowning in a sea of bad ideas. 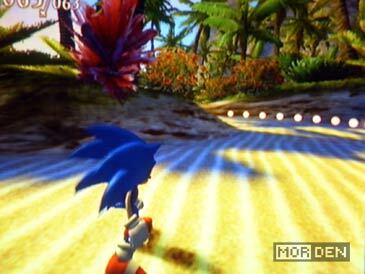 I absolutely loved Super Mario 64 and later Super Mario Sunshine - was there a memorable Sonic game for the Saturn? Not that I can think of. Was there a good Sonic title present on the GameCube or Xbox? Unless Sonic Heroes strikes your fancy, again, no. You'll have to excuse or overlook my "the past and present of Sonic" rant, but I figured I'll type down some thoughts, since it's probably the first time I discuss Sonic the Hedgehog on my blog, aside from a brief mention of Sonic CD. It's just that every time a Sonic game comes out nowadays, I'm getting ready to be disappointed by default. How come I don't expect anything good from Sonic these days? It used to be a strong brand which, like Mario, was never supposed to go down the road of forced and cheap sequels. 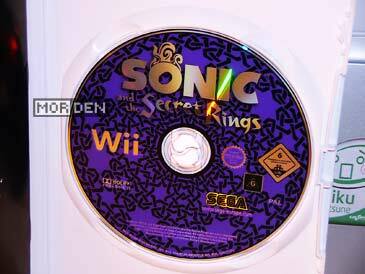 But enough about that - let us focus on the title at hand, which is Sonic and the Secret Rings for Nintendo Wii. As usual, I am fashionably late to the party, acquiring a title that's been around for almost as long as the Wii itself. Fortunately for me, Secret Rings was a nice game back then ,and its charm has not worn off just yet. There arent that many big platforming titles for the Wii, anyway - not to get this one would be like turning ones back to one-fifth of the decent Wii platform game line-up. As we all know, Wii is not your regular kind of console. It's far behind the competition when it comes to processing power and it features some peculiar controls. 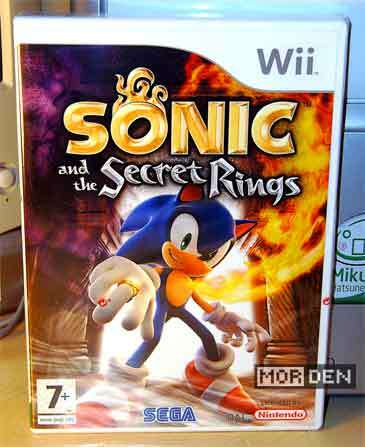 Secret Rings is a Wii exclusive and there's a reason behind this: The whole game is built around the Wii controls. Your character will always run unless you conciously press a button to stop him, and you turn left and right by tilting your Wii remote, which you hold horizontally. There are a couple of special moves and a jump button, of course, but this kind of gameplay would not work on other platforms, that's for sure. 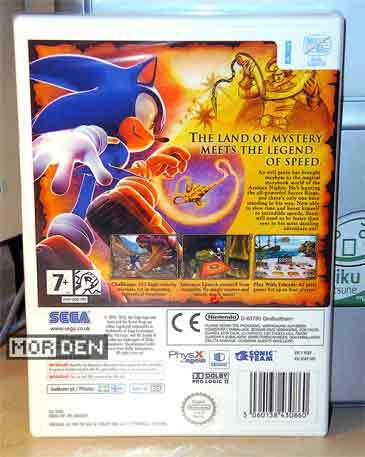 When you play Secret Rings for the first time, you instantly feel that this time around Sega did try something new, perhaps in an act of desparation, trying to make things better for their blue mascot. The game feels kind of fresh, taking a step aside from numerous Sonic Adventure clones. Most of the gameplay will have your characters locked onto a path from which you can't stray. This makes things fluent and enjoyable enough to justify the rather annoying and unresponsive controls. Even though you'll probably end up dying a hundred times in a row on some stupid obstacle, the game still keeps you motivated and for some reason you do want to see what's next. 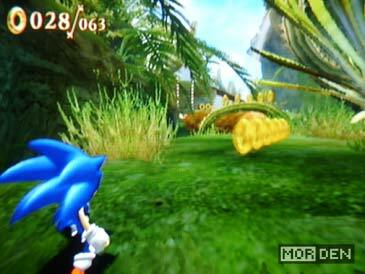 Now for the strangest part - While Wii may be well behind Xbox 360 and PlayStation 3 in the graphics processing department, Sonic and the Secret Rings looks better than any other Sonic game you've seen in a long, long time. The levels are enormous and I dare you to find a situation which causes the game to drop frames. It's all speed and eye-candy for Sonic this time around. If the uninspired storyline won't push you forward in your quest, an urge to see more of the gorgeous graphics surely will. Secret Rings is running smoothly thanks to the incredibly efficient Renderware engine, in conjunction with Ageia PhysX. This is a second, or rather first time Sonic Team chose PhysX for reasons unknown to me. 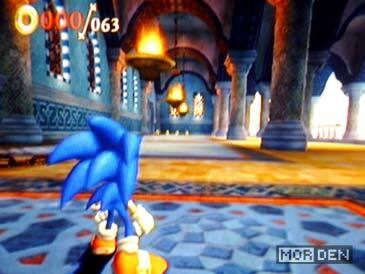 Just like in NiGHTS: Journey of Dreams, you can't really tell if a physics engine is used or not, since everything behaves exactly as it would in Sonic Adventure, or any other more recent Sonic game. The soundtrack is what you would expect, having played a couple Sonic games from the aforementioned Sonic Adventure upwards. It's a nice blend of soft to harder rock, spiced up with some middle eastern vibes. Strangely enough, the usual Sonic tunes seem to be absent, which is slightly disappointing. Having these memorable tunes present in every Sonic game makes you feel at home, and while this isn't vital to the gameplay, familiar tracks might compensate for some of the games shorcomings- Don't get me wrong, however. The soundtrack is great and you'll probably catch yourself humming "Seven Rings in Hand" after playing this game for a while. I know I didn't mention anything about the storyline, but what's there to mention, really? It's your standard "save the world" plot, with a twist of Arabian Nights and alot of cameo appearences. Sonic is an action game and I'd be lying if I said that I cared for the story in any of the hedgehog titles. During the MegaDrive days there was little to none emphasis on the story and it worked just fine. Nowadays people expect something more and something is exactly what they will get. 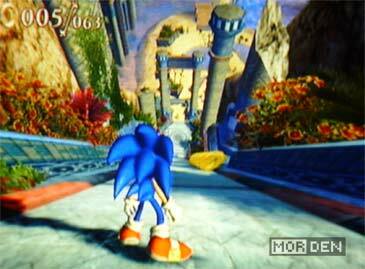 Sonic and the Secret Rings is a nice game, featuring some amazing graphics, plus a handfull of minigames. Just like NiGHTS: Journey of Dreams, it's worth a try and the chances are you won't regret this purchase. That's it for me this time around - there are still so many games I want to write about but, as usual, I'm to lazy to type it all up. Keep me motivated, dear readers. 2009.04.19 Sun Wii ☆ Nintendo DS Comment Tweet This! It's very very cool & fantastic! !